The hardest part of being a dog owner is losing your beloved pet. Dogs are typically with us for more than a decade, and they become a part of our families and a large part of our daily lives. More than likely, if you asked any dog owner what they could change about the canine species, they would say they wish they lived longer. I know I would! What if a pill could increase your dog’s life span? Not just by days, weeks or months, but by years – would you give it to him? It sounds kind of like a science fiction novel to me, but it may actually be possible in the near future. A new drug, called rapamycin, recently debuted as the first pharmaceutical to increase the life span of mammals. Now, researchers are recruiting an unlikely group of volunteers to help them study the effects of the drug – domesticated canines. 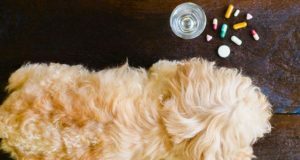 The University of Washington’s Dog Aging Project has partnered with a group of veterinarians to begin accepting applications for pet dogs living in the United States to take part in a study of rapamycin. Even more promisingly, in previous studies the drug increased the length of the animals’ life and their overall health. It was even effective when treatment was started later in life. Kaeberlein said that rapamycin has been shown to reverse age-associated cardiac dysfunction, protect against most forms of cancer, protect against age-associated cognitive decline and prevent obesity in normal laboratory mice. His hypothesis is that the anti-cancer and cardiac effects will be the easiest to detect in the research. He also believes that these may be the most important factors for overall health in aging canines. The initial phase of the study is mostly complete. It has identified a dose of rapamycin that doesn’t cause significant side effects. Kaeberlein is hoping to start a much larger study in the near future that involves many more canine volunteers. The Dog Aging Project aims to improve the period of life in which pets are the healthiest, not prolong the difficult senior years. Research in Geroscience, or the biology of aging, has made incredible strives in the past few years. The Dog Aging Process is hoping to work with researchers to help slow the aging process in canines so they can enjoy more time in the prime of their lives. I’ll definitely have to see the research, but wouldn’t it be wonderful if our dogs could live a few years longer without any negative side effects. My main concern would be that my pet’s quality of life would stay the same in those later years, or at least as good as it normally would be for a senior dog. To me, this drug sounds a little too good to be true, but I suppose only time will tell. Imagine what you could do with three or four more years with your pet? The added love and adventures that you would have would be invaluable. I’ll be following this research closely and will be sure to update when there is new information available.